Cleco 88 Series Trigger Start Sliding Knob Reverse Pistol Grip Screwdrivers have a Cleco motor that is the industry standard for durability and is easy to repair and maintain, with high parts interchangeability to other Cleco products. 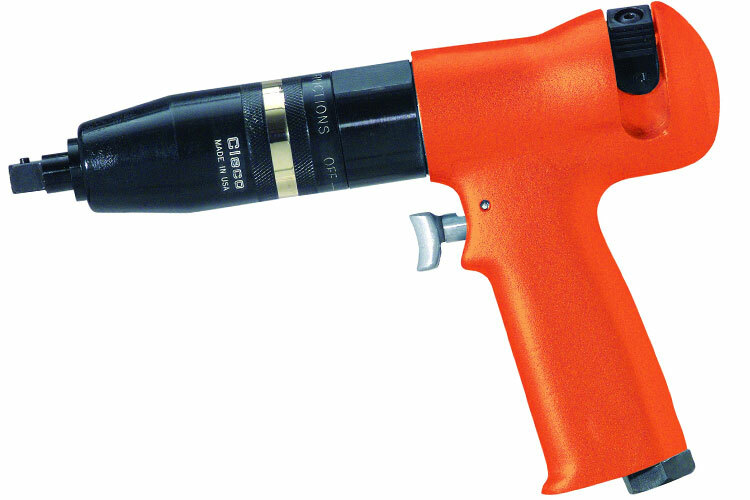 Cleco 88 Series Trigger Start Sliding Knob Reverse Pistol Grip Screwdrivers have an external torque adjustment and 1/4'' hex quick change drive. Cleco 88 Series Trigger Start Sliding Knob Reverse Pistol Grip Screwdrivers feature a compact design that increases productivity, saves weight, and is easy to integrate into any assembly environment. Cleco 88 Series Trigger Start Sliding Knob Reverse Pistol Grip Screwdrivers feature the renowned Clecomatic clutch. The renowned Clecomatic clutch has been re-engineered to provide class-leading accuracy/repeatability and improve its' already legendary durability. The 88RSATP-5C-3 Cleco 88 Series Trigger Start Sliding Knob Reverse Pistol Grip Screwdriver, 3/8'' Square Drive is one of thousands of quality tooling products available from MRO Tools. Please browse Cleco 88 Series Trigger Start Sliding Knob Reverse Pistol Grip Screwdrivers for tools similar to the 88RSATP-5C-3 Cleco 88 Series Trigger Start Sliding Knob Reverse Pistol Grip Screwdriver, 3/8'' Square Drive. 88RSATP-5C-3 Cleco 88 Series Trigger Start Sliding Knob Reverse Pistol Grip Screwdriver, 3/8'' Square Drive description summary: Cleco 88 Series Trigger Start Sliding Knob Reverse Pistol Grip Screwdriver 3/8'' Square Drive Torque Range: 15-160in.-lbs./1.7-18Nm Free Speed (rpm): 400 Air Inlet NPT: 1/4'' Quantity discounts may be available for the 88RSATP-5C-3 Cleco 88 Series Trigger Start Sliding Knob Reverse Pistol Grip Screwdriver, 3/8'' Square Drive. Please contact MRO Tools for details.